After earning a BA degree from Smith College in 1894, in 1895 she became one of the first two American women admitted to graduate study at Oxford university. 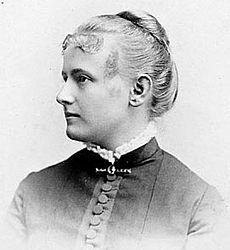 After returning to Boston, Scudder taught English literature at Wellesley College, where she becoming an associate professor in 1892 and full professor from 1910. While studying in England, she had come under the influence of people like John Ruskin,Leo Tolstoi, George Bernard Shaw, and Fabian Socialism. Back in Boston, she became actively involved in promoting her socialist ideas, especially Christian socialism. In 1888, two years after her return from Oxford, she joined both the Companions of the Holy Cross, a women’s group dedicated to intercessionary prayer and social reconciliation, and the Society of Christian Socialists . In 1890 she was a co-founder of the Boston “settlement house” Dennison House, part of a movement which had the goal of getting the rich and poor in society to live more closely together in an interdependent community, in which volunteer middle-class “settlement workers” would live, hoping to share knowledge and culture with, and alleviate the poverty of their low-income neighbors. From 1893 she was active in the trade union movement, and in 1911 she co-founded the Episcopal Church Socialist League and joined the Socialist Party, attempting to reconcile the conflicting doctrines of Marxism and Christianity. After the First World War, she also embraced capitalism, and in 1923 she joined the Fellowship of Reconciliation, giving a series of lectures before the Women’s International League for Peace and Freedom in Prague. She continued to be in the storm center of advanced thought in the church and in society, supporting by her name and by her writing such groups as Reinhold Niebuhr’s Fellowship of Socialist Christians and Rufus Jones’s Wider Quaker Fellowship. She worked closely with the Christendom group in England, encouraged Mother Pattie Ellis in her desire to establish the Community of the Way of the Cross, a women’s religious order combining active social work with monastic life, and followed closely the Reverend Frederick Hastings Smyth’s Society of the Catholic Commonwealth. As we now recognize the failings of the unrelenting pursuit of profit that have brought us to our present crisis, we would do well to reflect deeply on these words. It is not neither the capitalist “system” that has created the problem, but the failure of our values. As Scudder writes, we need to return to a Christian conception of what it is to be human, remembering all the many warnings of Jesus Christ on the dangers of riches and the pursuit of wealth. She is recognized as a saint by the Episcopal Church (USA), with a feast day on October 10th. Most gracious God, you sent your beloved Son to preach peace to those who are far off and to those who are near: Raise up in your church witnesses who, after the example of your servant Vida Dutton Scudder, stand firm in proclaiming the power of the Gospel of Jesus Christ, who lives and reigns with you and the Holy Spirit, one God, now and for ever. Amen. This is simply awesome! You have introduced me to a wonderful new lesbian saint, and I look forward to researching her and writing more about her (with a link to this post, of course). One question I have is what is the evidence that she was a lesbian?Saint Vida means a lot to me because my own great-aunt Mabel Hyde Kittredge was deeply involved in the settlement house movement — and with one of its women leaders Lillian Wald. Nobody has nominated them for sainthood yet. Obviously my first name Kittredge comes from that line of my family. Thanks, Kitt. Your family connection adds a fascinating dimension. I knew nothing about the settlement house movement until I started researching this post, and then found that there is also a connection with Dorothy Day's work with the Catholic Worker movement, which adapted the idea for their own houses. There's a lot more I would have like to follow up on, but I only came across the reference to her as a saint late yesterday, so I was pretty rushed to get something up in time for today, which was the anniversary of her death.The rush is also my excuse for not giving proper references. This line from Wikipedia is pretty clear, complete with a reference to a printed book (which obviously I've not been able to check):From 1919 until her death, Scudder was in a lesbian relationship with Florence Converse In Wellesley they resided at 45 Leighton Road.The relevant references are: Lillian Faderman (1991) Odd Girls and Twilight Lovers, A History of Lesbian Life in Twentieth-Century America pp. 23-24., Penguin Books Ltd, London. Who Was Who in America (1960) Marquis Who's Who, Inc., Chicago.A more oblique reference is from "The Lectionary" (the same one with the prayer I quoted, and lectionary readings for the day):"Throughout her life Scudder’s primary relationships and support network were women; her closest companion was Florence Converse, who shared in her religious faith and political ideals. "Seems clear enough for me.I'm sure there's a lot more for you to find. Have fun.